On Sunday mornings we gather together to worship God and meet one another but it is not always easy to get to know people well or dig deeper into questions of faith in this environment. For this reason we encourage people to join small groups. 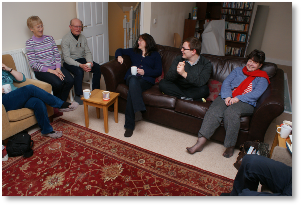 Small groups enable us to go further in developing our relationship with God and each other; To help us to build community and find our place within it. We have a variety of groups to join and are looking to form new ones so that we have a range of options to fit in with lifestyle and where you are in your journey of faith. Groups usually begin with refreshments and include worship, reading the bible, discussion and prayer. If you’ve not yet shared in small group life, why not come along and give it a try. Wednesdays, 10.30am at Richard and Debbie’s.